The other day I watched my 2-year-old turn into a big business tycoon. She pulled a rolling chair up to a desk, picked up an imaginary cell phone and shouted nonsense (very serious nonsense) at an imaginary peon on the other end of the phone. When she was done, she hung up the phone, put it in her pocket and slammed her hands down on the desk with a little baby curse word. An hour before that, she was a kitty crawling around my living room floor on all fours, licking her paw and cleaning her face with it. Then she was a mommy, putting babies to bed and draping them with blankets and lullabies. And when we had friends over that evening, she shouted "Zombie!" and chased them around the living room, groaning and demanding "brains!" Sometimes I watch her playing pretend, coloring by herself or building towers out of blocks, and I feel like a terrible parent. The television tells me "your baby can read by age 2!" and "quick, teach your baby a second language before she's too old to learn anything!" My friends enroll their children in sports and music programs as early as possible and fill their days with structured activities. I thought that was what good parents did, though somehow it felt wrong. 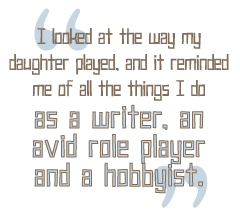 I looked at the way my daughter played, and it reminded me of all the things I do as a writer, an avid role player and a hobbyist. Turns out my instincts were about on target. What my daughter does when I'm not hassling her into more structured activities is called "free play," and developmental psychologists have been studying its positive effects on children for decades. Not long ago, a friend of mine who works with children as a therapist pointed me to an article in Scientific American that talks about the importance of free play for children. The piece discussed some possible difficulties for children who aren't given enough free time to play and some of the developmental advantages of child-led play. The hobbyist in me read what they called "free play" and immediately thought of roleplaying or creative storytelling. When you get right down to it, the difference between crawling around on all fours like a cat and dressing up in armor to spend an afternoon beating friends with boffers is pretty minimal. But much to my disappointment, the article warned that such games are actually a form of structured play that can undermine the whole point of free play.